In yesterday’s post, Add a Target Line, I showed how to add a simple horizontal line target indicator to a chart. What if your target isn’t constant. 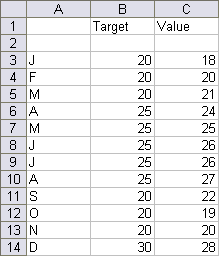 I’m not talking about your boss’ moving target, but a case illustrated by the following dummy data. Our company makes widgets, which are more popular in spring and summer, as well as at the year end holidays. Most of the year our target is 20 units, but from April through August the target is 25, and in December we aim for 30 units. We could simply create a line chart to show both the target and actual values. However, the target looks too much like the actuals, and we’d like them to look more different, so they can be distinguished at a glance. Posted: Wednesday, July 30th, 2008 under Combination Charts. Tags: Chart Types, Combination Charts, Formatting, Target. Many of these posts have described differences between XY and Line charts. One difference that’s been mentioned but not examined is that an XY axis recognizes the complete numerical value of its X data, while a line chart only recognizes whole number (integer) categories. Even if you use a Date-Scale X axis in a line chart, the dates are treated as categories, and you can only plot a point on a date, not on a time between midnight and midnight. Posted: Monday, July 28th, 2008 under Combination Charts. 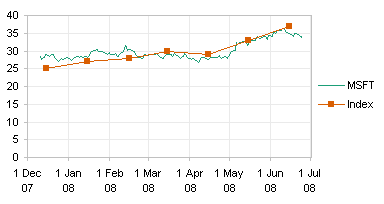 Tags: Chart Axes, Chart Types, column-xy combo, Combination Charts, date-scale axis, line-xy combo. When people think of an Excel combination chart, they usually think of a chart with lines and columns, or something similar that they found on the list of “Built-In Custom” chart types (I just love that oxymoron). However, line and XY series are types that combine to make decent charts. 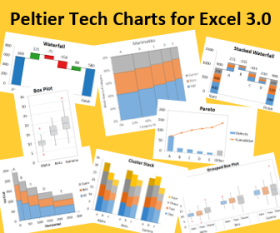 The line chart’s Date Scale category (X) axis provides the only proper date formatting in all of Excel, while the XY chart type provides a great deal of flexibility missing from line charts. The chart below shows six months of daily stock data, using a line chart, and six months of an imaginary monthly market index. Note two features of this chart. First, the date axis ticks are displayed at the first of every month (the vertical gridlines are usually unnecessary, but I’ve added them here to help illustrate the axis scaling). 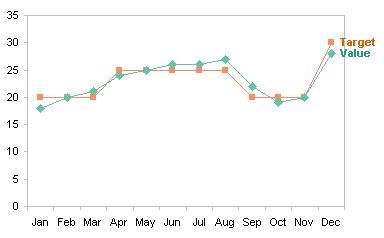 This can only be done using a line chart; in an XY chart, you have to pick a single value for the tick spacing, so you cannot accommodate the unequal days in a month. Second, the markers for the market index are not plotted on the same dates as the stock price data. This could be done in a line chart, if you didn’t mind a lot of blank cells, but using an XY chart type for this series makes it simple without having to precondition the data. As far as the appearance of the series is concerned, you can use XY or line types interchangeably. Either chart type accommodates lines or no lines, markers or no markers. You don’t have to use a “Line” chart just because you want your markers to be connected by a line. The difference between Line and XY charts is in how the X values (dates) are presented on the chart. Posted: Thursday, June 26th, 2008 under Combination Charts.